Toronto is a very diverse city very reminiscent of Chicago. It has underground tunnels, waterways, bustling business, and attractions. The end of May had spectacular weather for visiting, especially escaping the heat of the south where I am from. It is clean, and relatively safe for a large city. I was there for three days, and decided to go the “cheesy tourist” route to make sure I got everything in. I decided to do a full day in Toronto tour through Viator. It started at 8:30 in the morning and the fee was around $130. I am not really one that will nickel and dime on a trip, but when I added up the costs of all the attractions by the end of the day, it really was a good deal. 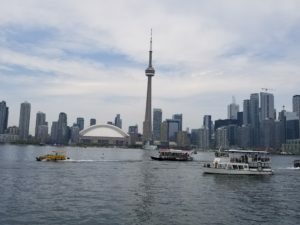 It included a trip to the CN tower, Casa Loma, and a boat tour to the Toronto islands. It was a cheesy boat, but a boat nonetheless 🙂 The tour guide was amazing and very knowledgeable about Toronto. I personally love to go on a tour from someone that has grown up in the city, which Jon had. He was full of info, which he told us as we went through town in the van. They also did a good job of pairing us up. The other van that started at the same time had larger groups. Our group had many singles which made it easy to “make friends”. It made the day really enjoyable. I will go through the stops if you want to do these on the hop-on, hop-off, which is also an option. The one difficult thing about that is that if you only have a day, it only stops every 30 minutes at the stops. This tour really hit everything rather quickly. The hop-on, hop-off may be better of you are there multiple days. This market feels something like a mix between Charleston and Seattle but a million places to buy Canadian bacon. 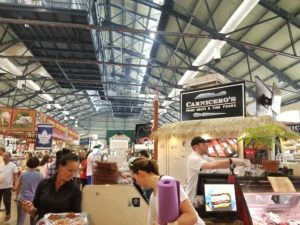 You can grab a sandwich, get plenty genuine maple syrup ( some of the best prices to buy it), and try different food from all over the world. The downstairs has some real surprises, with some unique bakeries and international food. Their claim to fame is “North America’s only full sized castle and Toronto’s premier historic attraction.” In 1911, Sir Henry Pellatt engaged noted architect E. J. Lennox to him realize a lifelong dream, the creation of an Edwardian castle on top of a hill overlooking Toronto. It took 300 men nearly 3 years to complete the nearly 200,000 square foot castle. If you are into movie filming, you would be into this. Personally, it was a little tacky for me. A house built in the 1910s that looks like a castle in Scotland feels terribly out of place. The story of the guy that built it was very interesting, but for me, it was just okay. There have been a million movies filmed there, from X-Men, Cocktails, Moulin Rouge, The Pacifier, and the list goes on. The coolest part for me was that it is in the neighborhood where Drake grew up, so it was worth the trip out there for that! This is a must in Toronto. It takes under an hour, but the views are spectacular and a staple of Toronto. If you go right when they open, there won’t be a wait. Otherwise, to go in the top tower ( worth the extra $15), it will be a wait of over 30 minutes at times. The bottom portion is netting and open air. It is difficult to see and with the netting, you won’t be taking pictures. The upper portion is easier to see and easier to take photos. This was the last stop on our tour. It was a tour that just has a programmed speaker that told you what was happening around you. It took us out on the water, and more than anything, it was some beautiful views of the city from the water. There is an airport right on the water, so you see planes coming in as well. It is very fun and beautiful. It was a fun final stop. We wrapped up around 3:00. If you only have a little time in Toronto and want to see all of the sights, not a bad place to go. This was where “All of the cool kids were”. Everyone that was dressed in fun clothes and hip was hanging out in this area. Every restaurant was packed- make reservations. We went to Gusto. It had a very fun deck on top, and the food was also delicious. I would recommend going back! If you go to Toronto, you are probably going to do a day tour to Niagara. some do Niagara Falls and a day tour to Toronto. Niagara has a ton of tourists, and there are casinos, golfing, did I mention tourists? Since We did the Toronto to Niagara tour, I chose the night tour. In the spring, they have fireworks at night. I am a sucker for fireworks, plus the days trips are much more populated, so I will take less people all day. There are very few companies that take you from Toronto to the Falls for the night tour. VIP tours was one of them. We booked a mini tour and it ended up being just 2 of us. We lucked out getting a private tour! It was nice, because many of the tour companies will cancel on you if there aren’t enough people for them to make good money. They hired an outside guy to do our tour, who really didn’t speak to us. It really was less of a tour, and more of a driver. That was fine for us, but if you wanted a talker, not the tour. They picked us up at the hotel and took us to a winery on the way. Canada is known for its “Icewine”, which is very sweet wine harvested after grapes stay on the vines after freezing temperatures. There are hundreds of wineries in this region. They took us to Lakeview wineries, known for many different brands, including wine by Dan Ackroyd. the problem I had with this was that for 2 people, we could have gone to a small winery, and instead went to a mass produced one with buses. You expect that on large tours- they have to go place that can accommodate large groups. I wish they had put more focus on that portion. Second, we stopped at Niagara on the Lake. We only had about 15 minutes, but I could’ve spent hours there. Cute bakeries, gift shops, people just enjoying the day. 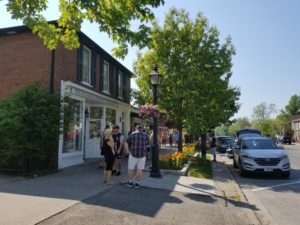 Niagara on the lake is a large area includes golf courses, little markets, places to picnic on the water- it is so adorable. If I had to stay somewhere when I returned, a bed and breakfast in this area would be on the list. We also stopped at Walker’s Country Market, which has strawberries picked daily, local jams and jellies, and sandwiches made on site. It was a quant little place to eat lunch. (15796 Niagara Parkway, Niagara-on-the-lake, ON L0s 1J0, Phone 905-468-2667). We then headed to the actual falls. If you are adventurous, you can actually zip line over the falls! Walk to the left of the falls, there is a cable trolly that goes over a portion. The Canadian side has all of the best views, but if you are reading this post, you are probably coming from the Canadian side. You have to go on the obligatory “hornblower” which is the boat where you wear a poncho and get soaked while going under the water. The enthusiasm is infectious and fun. We then ate dinner at the Elements restaurant.